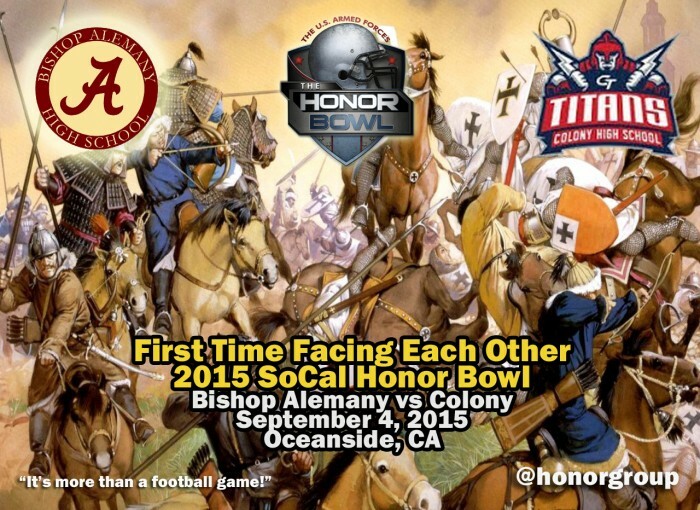 Colony (71) vs Alemany (13)This is the first time these two storied programs have met. Colony was the Mt. Baldy League Champion and won the Central Section CIF crown. The Titans will return with prolific QB Josh Thompson who passed for 2263 yards. Head Coach Steve Randall is excited to be part of The Honor Bowl and understands the mission of the event. Alemany, led by Head Coach Dean Herrington plays in the tough Mission League. Fun fact: Alemany beat Eastside Catholic in 2014 in the Out of State Battle in Washington. Be prepared for a bonanza of a match up!